Gymi is a health club for children and teenagers. Our mission is to be a part of families’ lives and improve the health and well-beeing of young people. We offer a variety of instructed classes for children, from babies up to teenagers. In addition to our weekly classes, we organize camps for school-aged children during school holidays as well as fun active parties. Training at Gymi is healthy, safe, rewarding and fun! All programs are carefully designed to meet the needs of today’s children. We also design our Gymi® equipment and apparatus to make all training at Gymi more and more optimal and up-to-date. We are looking for the best Master Franchisees and Franchisees to make their dream of a health club come true! Our training program prepares you for conquering the world of children’s wellness. We are looking for people with a heart burning for kids´and teens´ health and well-being. We want to find co-operative and eager Master Franchisees and Franchisees who want to deliver our message of fun natural movement to children and teens all around the globe and in all kinds of cultures! With our carefully structured concept something that might seem difficult is made easy. The training prepares you to perform on a high level, producing high-quality services for families. It is about making a difference and making a business. It’s back to basics! 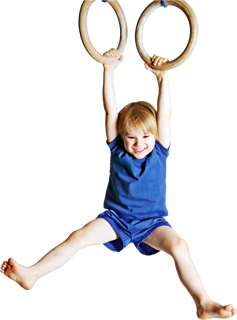 Exercising and doing sports at Gymi improves the health and well-being of your child. Everyone gets to challenge himself/herself on his/her own level and learns skills safely. All classes are planned according to sensitive periods and development phases; this is how learning new skills is made fun and rewarding. 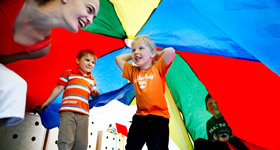 Group sizes are small enough to ensure learning of new skills and a cozy and safe environment. Safety at Gymi is created by secure adults as well as a safe environment and safe equipment. Our programs ensure secure progressions. A great amount of emphasis is also put on social and mental well-being. Inner motivation is built by creative drills and a positive atmosphere. Also children with special needs participate in physical education at Gymi.